We strive hard to meet our customers' expectations of superior quality. Our customer base is continually expanding through referrals from satisfied customers due to our reputation for high-quality craftsmanship. We design and build pools of an exceptional quality and they are always thoroughly checked to ensure they meet our unrivalled high standards before handing over to you for years of pleasure. The National Spa and Pool Institute (better known as the NSPI) is a watchdog organisation which has the interests of the industry as a whole at heart. 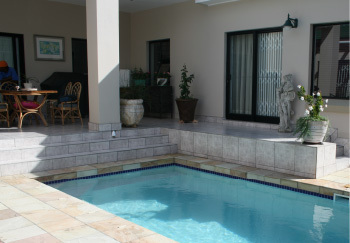 This means it is there for the benefit of pool builders and other members as well as pool owners. Formed in the Western Cape in July 1972, the NSPI owes its origins to the American NSPI, formed two decades earlier than ours. As long standing active members of the National Spa and Pool Institute our swimming pool construction exceeds the National Swimming Pool Institute (NSPI) and South African Bureau of Standards (SABS) specifications. We are one of the most highly awarded pool companies having received numerous NSPI awards since 1985; we strive to maintain the highest standard of quality, workmanship and after sales support. The National Spa & Pool Institute, holds annual award ceremonies, showcasing the winning entries from across the country of fellow NSPI builder members. Entries are judged by a panel of architects, interior designers, builders and the like from photographs supplied by the builder member and judged on many aspects of the final construction. Our Awards include Gold, Silver & Bronze in at least one or more categories.